We describe a technique for using murine embryonic stem cells for generating two or three dimensional embryoid bodies. We then explain how to induce neural differentiation of the embryoid body cells by retinoic acid, and how to analyze their state of differentiation by progenitor cell marker immunofluorescence and immunoblotting. Yang, J., Wu, C., Stefanescu, I., Horowitz, A. Analysis of Retinoic Acid-induced Neural Differentiation of Mouse Embryonic Stem Cells in Two and Three-dimensional Embryoid Bodies. J. Vis. Exp. (122), e55621, doi:10.3791/55621 (2017). Mouse embryonic stem cells (ESCs) isolated from the inner mass of the blastocyst (typically at day E3.5), can be used as in vitro model system for studying early embryonic development. In the absence of leukemia inhibitory factor (LIF), ESCs differentiate by default into neural precursor cells. They can be amassed into a three dimensional (3D) spherical aggregate termed embryoid body (EB) due to its similarity to the early stage embryo. EBs can be seeded on fibronectin-coated coverslips, where they expand by growing two dimensional (2D) extensions, or implanted in 3D collagen matrices where they continue growing as spheroids, and differentiate into the three germ layers: endodermal, mesodermal, and ectodermal. The 3D collagen culture mimics the in vivo environment more closely than the 2D EBs. The 2D EB culture facilitates analysis by immunofluorescence and immunoblotting to track differentiation. We have developed a two-step neural differentiation protocol. In the first step, EBs are generated by the hanging-drop technique, and, simultaneously, are induced to differentiate by exposure to retinoic acid (RA). In the second step, neural differentiation proceeds in a 2D or 3D format in the absence of RA. ESCs originate from the blastocyst inner cell mass. These cells are pluripotent, i.e. they have the capacity to differentiate into any cell type of the organism of origin. ESC in vitro differentiation is of wide interest as an experimental system for investigating developmental pathways and mechanisms. It offers a potent and flexible model system to test new therapeutic approaches for correction of cell and tissue dysfunction. EBs recapitulate many aspects of cell differentiation during early embryogenesis. In particular, EBs can be used when embryonic lethality makes it difficult to determine the cellular basis of the embryonic defects1,2. EBs can be formed either by the hanging drop or liquid suspension techniques3. The advantage of the former is the ability to generate EBs of consistent size and density, thus facilitating experimental reproducibility. Interaction with extracellular matrix (ECM) adhesion proteins may affect the motility and survival of adherent cells. In the 2D culture system, fibronectin is often applied to increase cell adhesion to the substrate. Fibronectin is a basal lamina component recognized by 10 types of cell-surface integrin heterodimers4. RA is a small lipophilic metabolite of vitamin A that induces neural differentiation5,6. High concentrations of RA promote neural gene expression and represses mesodermal gene expression during EB formation7,8. RA is produced by vitamin A oxidation to retinaldehyde by either alcohol or retinol dehydrogenase, followed by retinaldehyde oxidation to the final product by retinaldehyde dehydrogenase9. Neural differentiation requires transport of RA from the cytoplasm to the nucleus by cellular RA-binding protein 2 (CRABP2). In the nucleus, RA binds to its cognate receptor complex consisting of a RAR-RXR heterodimer10. This results in recruitment of transcriptional co-activators, and the initiation of transcription9,11. Furthermore, RA promotes the degradation of phosphorylated (active) SMAD1, thus antagonizing BMP and SMAD signaling12. In addition to these activities, RA increases Pax6 expression, a transcription factor that supports neural differentiation13. RA signaling is modulated by sirtuin-1 (Sirt1), a nuclear nicotinamide adenine dinucleotide (NAD+)-dependent enzyme that deacetylates CRABP2, interfering with its translocation to the nucleus, and hence with RA binding to the RAR-RXR heterodimer14,15,16. Our goal in designing the RA-treated EB protocol described here is to optimize neural differentiation in order to facilitate in vitro analysis of the signaling pathways that regulate ESC differentiation into neuronal precursor cells. One of the advantages of this protocol is facilitation of the analysis of cell function by immunofluorescence. 3D EBs are not well penetrated by antibodies and are difficult to image. EB dissociation into a 2D monolayer at specific time points during neural differentiation facilitates immunolabeling and imaging of the cells by confocal microscopy. Prepare MEF medium, Dulbecco's modified Eagle's medium (DMEM, high-glucose), supplemented with 15% fetal bovine serum (FBS). Coat 100 mm cell culture dishes with 0.5% gelatin solution for 30 min at room temperature (RT). Count MEFs using a cytometer. Remove the gelatin solution and immediately pour MEF medium pre-warmed to 37 °C. Rapidly thaw vials of mitomycin C-treated MEFs in a 37 °C water bath for 2 min, then seed 2.8 x 106 MEFs per 100 mm gelatin-coated dish. Adjust cell number accordingly if using dishes of other sizes. Incubate MEFs overnight at 37 °C, 5% CO2. Change the medium on the next day. Culture for 2-3 days until the MEF layer is confluent. Prepare ESC medium, Iscove's modified Dulbecco's medium (IMDM) supplemented with 15% FBS and 103 U/mL leukemia inhibitory factor (LIF), 0.1 mM nonessential amino acids, 55 mM 2-mercaptoethanol, penicillin (100 U/mL), streptomycin (100 µg/mL), gentamicin (200 µg/mL), and 0.2% mycoplasma antibiotic. Remove MEF medium from the dish prepared in step 1 and replace with 37 °C pre-warmed ESC medium. Defrost an ESC vial and seed cells on top of the MEF layer. Incubate at 37 °C, 5% CO2, until ESCs reach confluence. Prepare new cell culture dishes containing a confluent monolayer of MEFs. To passage the ESCs, wash once with PBS and detach with 0.25% trypsin/EDTA for 2-5 min at 37 °C, 5% CO2. Stop the trypsinization by adding fresh IMDM with 15% FBS to the detaching cells, transfer the cell suspension to a 15 mL tube, and centrifuge at 160 x g for 5 min at RT. Remove the supernatant, resuspend ESCs with fresh IMDM and passage one fifth of the cells to each new MEF-coated dish; incubate until cells reach confluence (typically 4-5 days). Once ECSs reached confluence, detach them and MEFs with 0.25% Trypsin/EDTA as in step 2.4, resuspend the cells in fresh IMDM, transfer to a non-adhesive bacteriological petri dish, and incubate for 40 min at 37 °C, 5% CO2. Carefully transfer ESCs and MEFs-containing medium to a new gelatin-coated plate using a 5 mL pipette, avoiding repeated pipetting. The cells remaining in the petri dishes are MEFs, since ESCs do not adhere. Passage the ESCs every 3-4 days. Less frequent passaging may reduce ESC pluripotency. Do not exceed 60% confluence, as it may favor differentiation. Repeat steps 3.2-3.3 three times or more, as required, until MEFs are no longer detectable by a cell culture microscope, using a 20X objective, to make sure MEFs are not present. Verify ESC pluripotency by checking ESC culture to see if the cells form dense colonies with typical ESC polygonal morphology (Figure 1A). Test cell stemness by quantitative reverse transcriptase polymerase chain reaction (qRT-PCR)17, immunoblotting17, or immunofluorescence of core pluripotency transcription factors17 (Figure 2). Prepare all-trans-RA stock solution at 10 mM in DMSO, and aliquot into 1.5 mL light-protected microfuge tubes. The solution is stable at -80 °C for up to two weeks. Protect it from light. Trypsinize ESCs as in step 2.4; replate in fresh IMDM without LIF, as a single-cell suspension. Count cells using a hemocytometer, and prepare a 5 x 105 cells/mL suspension in IMDM with 0.5 µM RA. Plate 100 20-µL-drops per 100-mm petri dish with an 8-channel pipette and 200 µL tips, invert the dishes, and fill the inverted lid with PBS to prevent hanging drops from drying. Protect RA-containing culture media from light. Culture EBs in hanging drops at 37 °C, 5% CO2, for 4 days. Coat 12 mm circular glass coverslips with 30 µg/mL fibronectin for 30 min at RT. Place each coverslip in a well of a 24-well plate, and add 1 mL IMDM per well. Harvest 3 day-grown hanging drop EBs one by one with 200 µL pipette tips and seed them on the fibronectin-coated coverslips, 20 EBs per well, using the same pipette tips. NOTE: 3-day EBs are preferable over 4-day EBs because they adhere better to the coverslips. Continue culture with IMDM-15% FBS without LIF. Replace medium every 3-4 days. Collect the used medium for protein secretion analysis as needed. Transfer 500 µL of EB medium to 10 kDa-cutoff centrifugal filters, spin at 20,000 x g for 60 min at 4 °C. Examine the medium remaining inside the centrifugal filters every 15-20 min to prevent excessive enrichment. Stop centrifugation when the volume of the remaining medium has fallen to 25 µL. Collect the remaining concentrated medium after inverting the filter and spinning at 160 x g at 4 °C, following the manufacturer's instructions. Detect the secreted proteins by immunoblotting with specific antibodies17. Collect the EBs grown for 4 days in hanging drops as described in step 5.2, and place them in 1.5 mL centrifuge tubes (30 EBs per tube). Prepare collagen gel solution following the instructions of the 3D collagen culture kit (see Materials/Equipment Table). Dilute appropriate volumes of collagen solution and 5x DMEM (a kit component); add the neutralization solution (a kit component) and mix well immediately, and keep this on ice. Pipette an appropriate volume of chilled collagen solution into the 1.5 mL tube containing the EBs, and gently transfer to the wells of a 6-well plate using a 1 mL pipette tip. Avoid making bubbles. Immediately transfer the plate to 37 °C, 5% CO2, for 60 min to initiate collagen polymerization. Overlay the EB-containing plate with IMDM. Change medium every 3-4 days. Collect the day 4 EBs (from step 4) one by one, with 200 µL pipette tips and transfer them to a non-adhesive bacteriological petri dish containing IMDM with 15% FBS; culture at 37 °C, 5% CO2 for 4 more days. Check the EBs twice every day to make sure they do not attach to the bottom; gently shake the dish to prevent EB attachment to the bottom. Centrifuge the EBs at 185 x g for 5 min at RT, in a benchtop centrifuge. Remove the supernatants. The pellet should not exceed 100 µL in each tube. Add to pelleted EBs 1 mL 0.25% type I collagenase per tube, supplemented with 20% FBS in PBS. Incubate the EB-collagenase mixture for 1 h at 37 °C, 5% CO2, pipetting it gently every 20 min, using 1 mL pipette tips. Wash the cells gently 3x with PBS. If cell aggregates are present, use a cell strainer with a 100-µm mesh to remove them. Replate the cells on a gelatin-coated 60 mm dishes in IMDM. Then incubate at 37 °C, 5% CO2. For qRT-PCR and immunoblotting, coat a 6-well plate with 0.5% gelatin. For immunofluorescence, coat glass coverslips with 30 µg/mL fibronectin for 30 min at RT. Place each coverslip in a well of a 24-well plate. Add IMDM. Seed 4.75 x 105 or 1 x 105 dissociated EB cells (steps 8.4-8.7) per well in 6- or 24-well plates, respectively. Grow the cells to 70% confluence before transfection. Transfect the cells by a nonliposomal lipid stem-cell-optimal reagent17 (see Materials/Equipment Table), following the manufacturer's instructions. NOTE: The reagent we used typically reached a transfection efficiency of 50% (see Representative Results). Analyze the samples by qRT-PCR or by immunoblotting17 2 or 3 days after transfection, respectively. Wash 2D EBs or dissociated 3D EBs with PBS and fix with 4% paraformaldehyde in PBS for 30 min at RT. Wash the fixed cells 3x with PBS to remove floating cell debris. NOTE: Paraformaldehyde is a skin and eye irritant; use caution when handling it. Add 1% triton X-100 in PBS to permeabilize the cells for 20 mins at RT, then wash 3x with PBS. Remove PBS and block with 5% BSA in PBS for 30 min. Prepare primary antibody dilution in 1% BSA/PBS supplemented with 0.03% triton X-100. Replace the blocking solution by the primary antibody solution. Incubate for 3 h at RT, or overnight at 4 °C, then wash cells 3x with PBS. Apply secondary antibody in PBS according to the manufacturer's instructions. Incubate for 1 h at RT, then wash cells 3x with PBS. Mount coverslips on glass slides with an anti-fade medium for optical microscopy. 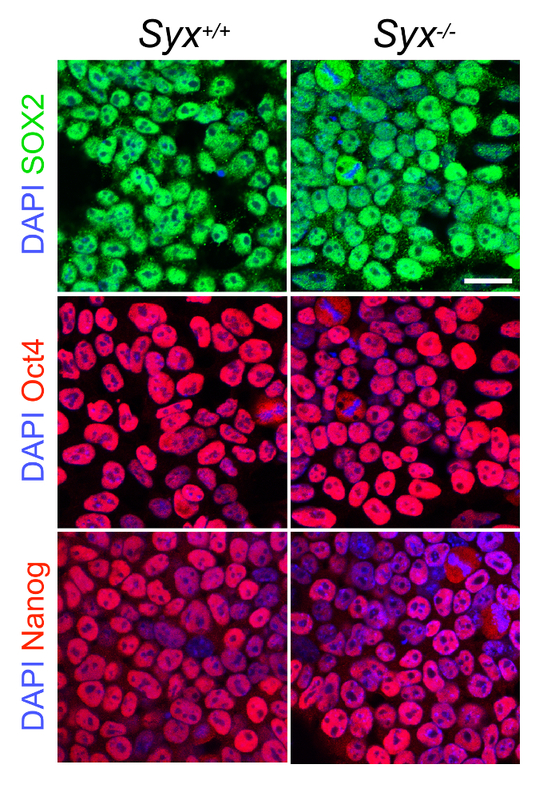 Oct4, Nanog, and SOX2 are the core transcription factors that confer ESC self-renewal and pluripotency. We applied the above protocol to compare the neural differentiation of ESCs from wild type and from a strain of genetically-modified mice where Syx, a gene coding for the RhoA-specific exchange factor Syx, is disrupted. We had implicated Syx in angiogenesis18. We noticed differences in the behaviors of EBs aggregated from Syx+/+ and Syx-/- ESCs, and proceeded to test if the neural differentiation of Syx-/- ESCs is faster than that of their Syx+/+ counterparts. To compare the initial state of Syx+/+ and Syx-/- ESCs, we quantified in each genotype the abundances of Oct4, Nanog, and SOX2, the core transcription factors that confer ESC self-renewal and pluripotency. As described in step 10 of the protocol, ESCs were immunolabeled by Oct4, Sox2, and Nanog antibodies. The abundances of the 3 transcription factors in Syx+/+ and Syx-/- ESCs were similar, as determined by immunofluorescence (Figure 2) and immunoblotting17 (Figure 2). EBs implanted in a 3D collagen matrix (Figure 1B) start sprouting cellular extensions that are visible on a cell culture microscope with a 10X objective, 2 days after implantation. On day 6, between 5 to 10 sprouts of 200 µm or less can be normally observed in Syx+/+ EBs, whereas in Syx-/- EBs, 30-50 sprouts are frequently observed, the majority of which are longer than 200 µm, (Figure 1C). We observed that cells extended faster from Syx-/- than from Syx+/+ 2D EBs (Figure 3A). To compare the rate of neural differentiation of the cells that extended from the Syx+/+ and Syx-/- EBs, we immunolabeled them after 6 days of 2D culture by the neural stem cell marker nestin, an intermediate filament regulatory protein19. Nestin's abundance was substantially higher in cells extending from Syx-/- EBs (Figure 3B). We then compared the abundance of nestin and tubulin β3 (Tubβ3), an axonal cytoskeleton protein20, in cells dissociated from 13-day 2D EBs. Both proteins were more abundant in cells dissociated from Syx-/- EBs than in their Syx+/+ counterparts (Figure 3C). We obtained similar results by quantification of immunoblotting of the same proteins17. Figure 4 shows cells transfected by constitutively green fluorescent protein (GFP)-fused active RhoA (RhoA-Q63L) using a stem-cell-optimal transfection reagent (see Materials/Equipment Table). Figure 1: Sprout Emergence from Syx+/+ and Syx-/- EBS in 3D Culture. (A) Syx+/+ and Syx-/- ESCs grew in clustered colonies before the induction of neural differentiation. (B and C) images of EBs formed in hanging drops with 0.5 µM RA, and then inserted into a 3D collagen matrix without RA, as described in steps 7.1-7.4. Images were captured on day 6 by the indicated objectives (Scale bars = 100 µm in A and C, 200 µm in B). Please click here to view a larger version of this figure. Figure 2: Presence of Pluripotency Core Transcription Factors. 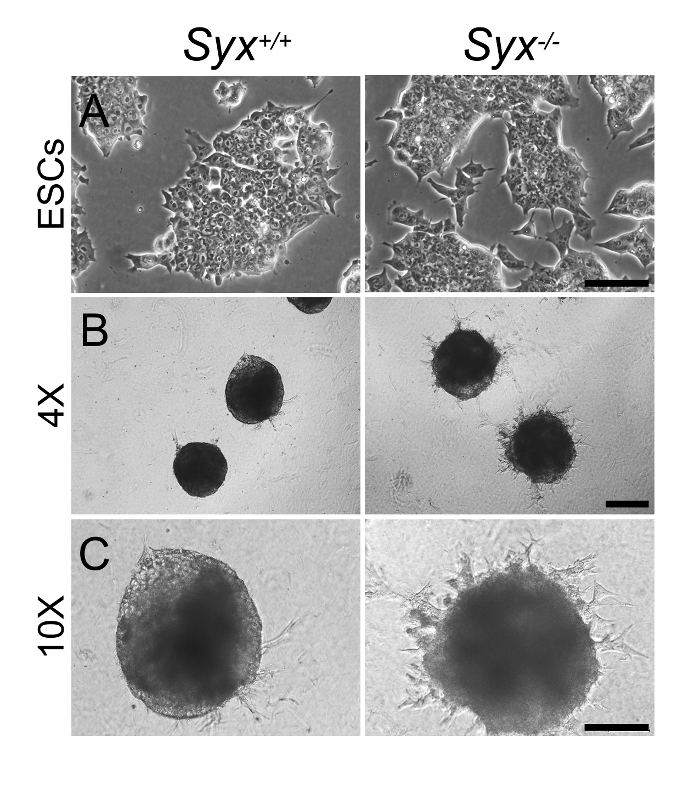 Representative images showing the abundances of the indicated core pluripotency markers in Syx+/+ and Syx-/- ESCs (Scale bar = 50 µm). See Yang et al.17 for details of the immunolabeling method (Scale bar = 50 µm; DAPI, 2-(4-amidinophenyl)-1H -indole-6-carboxamidine). Please click here to view a larger version of this figure. Figure 3: Visualization of Neural Differentiation Markers in EB Cells. (A) Phase images of 2D EB edges showing that cells expanded faster from Syx-/- than from Syx+/+ EBs (Scale bar = 200 µm). (B) Immunofluorescence images showing that the neural differentiation marker nestin was more abundant in cells expanding from 6 day 2D Syx-/- EBs than from their Syx+/+ counterparts (Scale bar = 50 µm). (C) Immunofluorescence images showing that the neural differentiation markers nestin and Tubβ3 were more abundant in cells dissociated from 13 day 3D Syx-/- EBs than from their Syx+/+ counterparts (Scale bar = 50 µm). Please click here to view a larger version of this figure. Figure 4: Visualization of the Efficiency of the Transfection Reagent. Three replicates of immunofluorescence images showing ESCs transfected by constitutively active RhoA fused to GFP to illustrate the transfection efficiency of the reagent used in step 9.5 of the protocol (Scale bar = 50 µm). Please click here to view a larger version of this figure. In this protocol we present a relatively simple and accessible method to study neural differentiation of murine ESCs. In previous protocols, RA was added to the medium at day 2 or day 4 of the EB hanging-drop8 or by suspension culture7, respectively, or immediately after the EB hanging drop aggregation21. In the protocol we devised, RA was added earlier. Despite the earlier introduction of RA to EBs formed by suspension culture, this protocol produced higher expression of neural differentiation markers8. Here, we favored applying RA and inducing neural differentiation at the start of the hanging drop culture. This modification allows equal RA exposure to the ESCs when they are still in a single cell suspension, before EB aggregation. When RA is added to aggregated EBs, cells in the EB inner mass are likely to sense a lower to RA concentration than cells in the outer layer. Application of RA at the start of EB aggregation is advantageous also because it suppresses endodermal and mesodermal germ layer development in favor of neural differentiation of the ectodermal layer7,8. We confirmed that RA treatment promoted neural differentiation by examining the abundance of close to 10 markers17. There are three critical considerations in this protocol. The first is maximum removal of the MEF feeder cells to achieve a high purity ESC population. The second is the light sensitivity of RA: its stock solution and the hanging drops must be protected from light after RA application. RA stock solution is stable only for two weeks, after which a fresh solution must be prepared. The third consideration is the RA concentration. In our pilot experiments, we found that at a concentration of 10 µM RA retarded cell growth and produced smaller-sized EBs compared to lower concentrations, possibly because RA can cause apoptosis at high conncentrations22,23,24. We observed that a RA concentration of 0.5 µM produced a larger number of well-formed EBs than at either higher25 or lower concentrations, and that the EBs reached an average diameter of around 200 µm. Larger EBs exceed the field size of a 10X objective and were, consequently, harder to image. Therefore, we chose 0.5 µM as optimal RA concentration. Analysis by immunofluorescence of 3D EBs is problematic because they are too brittle for frozen sectioning. Furthermore, we found that frozen EB sections do not stick well to uncoated electrostatically-treated glass slides. Preparation of 2D EB culture requires aggregation of extra hanging drops, because some EBs do not attach well to the substrate. EB dissociation, which is relatively slow, can be accelerated by pipetting the EBs up and down in a 1.5 mL microfuge tube during their incubation with collagenase. 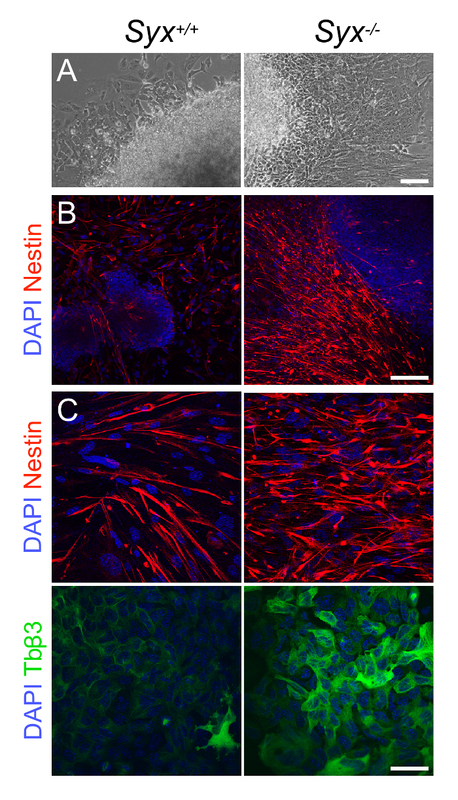 Neurally differentiated ESCs can be used to replace damaged endogenous cells, e.g. dopaminergic neurons lost in the substantia nigra in the brain of patients suffering from Parkinson's disease26. While current techniques of human ESC differentiation do not require EB formation (ibid. ), EBs are still a useful tool for detailed analysis of neural differentiation at the molecular level. This study was supported by NIH grant R01 HL119984 to A.H.
Hopfl, G., Gassmann, M., Desbaillets, I. Differentiating embryonic stem cells into embryoid bodies. Methods Mol Biol. 254, 79-98 (2004). Itskovitz-Eldor, J., et al. Differentiation of human embryonic stem cells into embryoid bodies compromising the three embryonic germ layers. Mol Med. 6, (2), 88-95 (2000). Dang, S. M., Kyba, M., Perlingeiro, R., Daley, G. Q., Zandstra, P. W. Efficiency of embryoid body formation and hematopoietic development from embryonic stem cells in different culture systems. Biotechnol Bioeng. 78, (4), 442-453 (2002). Johansson, S., Svineng, G., Wennerberg, K., Armulik, A., Lohikangas, L. Fibronectin-integrin interactions. Front Biosci. 2, d126-d146 (1997). Blumberg, B. An essential role for retinoid signaling in anteroposterior neural specification and neuronal differentiation. Semin Cell Dev Biol. 8, (4), 417-428 (1997). Ross, S. A., McCaffery, P. J., Drager, U. C., De Luca, L. M. Retinoids in embryonal development. Physiol Rev. 80, (3), 1021-1054 (2000). Bain, G., Ray, W. J., Yao, M., Gottlieb, D. I. Retinoic acid promotes neural and represses mesodermal gene expression in mouse embryonic stem cells in culture. Biochem Biophys Res Commun. 223, (3), 691-694 (1996). Okada, Y., Shimazaki, T., Sobue, G., Okano, H. Retinoic-acid-concentration-dependent acquisition of neural cell identity during in vitro differentiation of mouse embryonic stem cells. Dev Biol. 275, (1), 124-142 (2004). Duester, G. Retinoic acid synthesis and signaling during early organogenesis. Cell. 134, (6), 921-931 (2008). Niederreither, K., Dolle, P. Retinoic acid in development: towards an integrated view. Nat Rev Genet. 9, (7), 541-553 (2008). Maden, M. Retinoic acid in the development, regeneration and maintenance of the nervous system. Nat Rev Neurosci. 8, (10), 755-765 (2007). Sheng, N., et al. Retinoic acid regulates bone morphogenic protein signal duration by promoting the degradation of phosphorylated Smad1. Proc Natl Acad Sci U S A. 107, (44), 18886-18891 (2010). Gajovic, S., St-Onge, L., Yokota, Y., Gruss, P. Retinoic acid mediates Pax6 expression during in vitro differentiation of embryonic stem cells. Differentiation. 62, (4), 187-192 (1997). Dong, D., Ruuska, S. E., Levinthal, D. J., Noy, N. Distinct roles for cellular retinoic acid-binding proteins I and II in regulating signaling by retinoic acid. J Biol Chem. 274, (34), 23695-23698 (1999). Sessler, R. J., Noy, N. A ligand-activated nuclear localization signal in cellular retinoic acid binding protein-II. Mol Cell. 18, (3), 343-353 (2005). Tang, S., et al. SIRT1-Mediated Deacetylation of CRABPII Regulates Cellular Retinoic Acid Signaling and Modulates Embryonic Stem Cell Differentiation. Mol Cell. 55, (6), 843-855 (2014). Yang, J., et al. RhoA inhibits neural differentiation in murine stem cells through multiple mechanisms. Sci Signal. 9, (438), ra76 (2016). Garnaas, M. K., et al. Syx, a RhoA guanine exchange factor, is essential for angiogenesis in Vivo. Circ Res. 103, (7), 710-716 (2008). Chou, Y. H., Khuon, S., Herrmann, H., Goldman, R. D. Nestin promotes the phosphorylation-dependent disassembly of vimentin intermediate filaments during mitosis. Mol Biol Cell. 14, (4), 1468-1478 (2003). Arai, T., Matsumoto, G. Subcellular localization of functionally differentiated microtubules in squid neurons: regional distribution of microtubule-associated proteins and beta-tubulin isotypes. J Neurochem. 51, (6), 1825-1838 (1988). Arnhold, S., Klein, H., Semkova, I., Addicks, K., Schraermeyer, U. Neurally selected embryonic stem cells induce tumor formation after long-term survival following engraftment into the subretinal space. Invest Ophthalmol Vis Sci. 45, (12), 4251-4255 (2004). Liu, Y., et al. Retinoic acid receptor beta mediates the growth-inhibitory effect of retinoic acid by promoting apoptosis in human breast cancer cells. Mol Cell Biol. 16, (3), 1138-1149 (1996). Altucci, L., et al. Retinoic acid-induced apoptosis in leukemia cells is mediated by paracrine action of tumor-selective death ligand TRAIL. Nat Med. 7, (6), 680-686 (2001). Pettersson, F., Dalgleish, A. G., Bissonnette, R. P., Colston, K. W. Retinoids cause apoptosis in pancreatic cancer cells via activation of RAR-gamma and altered expression of Bcl-2/Bax. Br J Cancer. 87, (5), 555-561 (2002). Kothapalli, C. R., Kamm, R. D. 3D matrix microenvironment for targeted differentiation of embryonic stem cells into neural and glial lineages. Biomaterials. 34, (25), 5995-6007 (2013). Cai, J., et al. BMP and TGF-beta pathway mediators are critical upstream regulators of Wnt signaling during midbrain dopamine differentiation in human pluripotent stem cells. Dev Biol. 376, (1), 62-73 (2013).